At Alderley Edge, the Club keeps a range of equipment (also listed under the page showing Club tackle) as well as the Surgery and information centre. 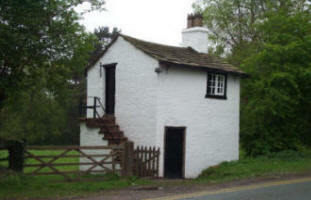 The Surgery is a two roomed (one up, one down) brick building at Alderley Edge which is available for use by Club members. The building is leased from the National Trust. The Club renovated the building (replacing floors and a section of roof) when it took the lease and is responsible for repairs and maintenance. 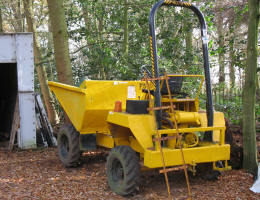 The Surgery is used as a meeting place and equipment store for Alderley Edge. The name, the Surgery, comes from its use in the past as a veterinary surgery although its full history is unknown. It seems to be present on some 18th century maps and could conceivably have been used as a mine office at one time. In the 19th century, one of the landlords of the Wizard was a vet and it is highly probable that he used the Surgery, and gave it its present name, until he moved to new premises (see left hand picture below). Behind the National Trust Information Centre at the Edge is a room which was adapted by the Club from a garage into an information and display centre. 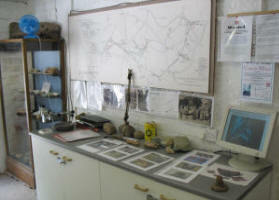 This was refurbished by the National Trust and connected to their information room so as to provide visitors to the Edge with better information about the Edge and the mines (see right hand picture below). A special feature of the Information Centre is that a shaft direct into the Cobalt Mine was found during the refurbishment and can now be viewed from above by visitors.